I am always amazed that folks, say those in government in places like San Francisco, consistently support restricting the supply of new housing while subsidizing home buyers and then are surprised when prices and rents keeps rising. From the Market Urbanism Report via Walter Olson. But a look at the numbers shows that, on the contrary, housing construction (or lack thereof) seems to be the driving factor behind whether or not large U.S. metros remain affordable. This would be the conclusion from 7 years of data from the Census Bureau, which publishes annual lists on the number of new privately-owned housing units authorized in each metro area. Between 2010 and 2016, when overall national housing permits ticked up each year following the recession, most major metros have issued housing permit numbers in the high 4- or low 5-figures annually. But three metros have stood far above the rest. The Dallas-Fort Worth-Arlington MSA issued 273,853 housing permits over this 7-year period; New York-Newark-Jersey City issued 283,814; and Houston-The Woodlands-Sugar Land topped every metro with 316,639 permits. Combined, the 3 metros accounted for 13.5% of the nation’s approved housing units. These statistics are glaring, and show that the urban housing affordability crisis, and its solution, is far simpler than many pundits suspect. In their ongoing quest to satisfy their anti-growth biases, they’ve settled on demand-side responses (read: government subsidies) that ignore or worsen the fundamental problem of under-supply; while they continue to blame various third party boogeymen, including developers, landlords, Airbnb hosts, techies, hipsters, Asian families buying second homes, and migrants in general. But, again, the Census data sheds light on the actual nature of the issue: some metros in America are building a LOT of housing. Other metros may think they are, but actually are not. And housing prices within given metros are either stabilizing or skyrocketing based on this decision. Progressive Narrative Fail: Why Are Low Income Workers and the Unemployed Running from High Minimum Wage States to Low Minimum Wage States? I think many folks are aware of how certain wealthy neighborhoods use zoning to keep out the lower-income people they don't want around (e.g. minimum lot sizes, minimum home sizes, petty harassment over home and lawn maintenance, etc.) If you think of California as one big rich neighborhood, many of their labor and housing laws have this same effect of keeping lower income people out. Every year from 2000 through 2015, more people left California than moved in from other states. This migration was not spread evenly across all income groups, a Sacramento Bee review of U.S. Census Bureau data found. The people leaving tend to be relatively poor, and many lack college degrees. Move higher up the income spectrum, and slightly more people are coming than going. About 2.5 million people living close to the official poverty line left California for other states from 2005 through 2015, while 1.7 million people at that income level moved in from other states – for a net loss of 800,000. The leading destination for those leaving California is Texas, with about 293,000 economically disadvantaged residents leaving and about 137,000 coming for a net loss of 156,000 from 2005 through 2015. Next up are states surrounding California; in order, Arizona, Nevada and Oregon. Wow, I am totally lost. The minimum wage currently in California is $10.50 an hour, going up to $15 over the next 5 years. The minimum wage in Texas is the Federal minimum at $7.25. If I understand it right from progressives, minimum wages are a windfall for workers that raise wages without any reduction in employment. 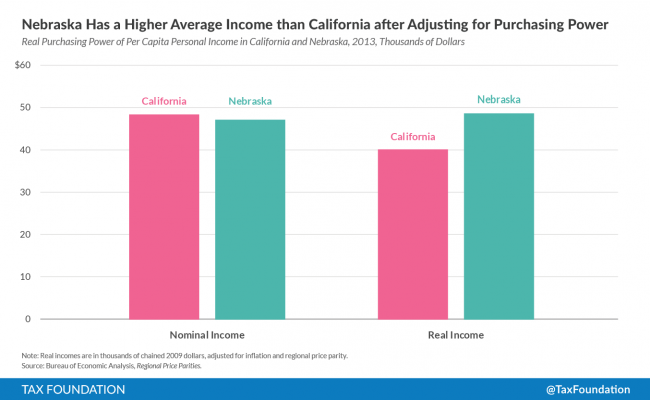 So why are the very people California claims it is trying to help leaving the state in droves? For unenlightened Texas, of all places. Of course the reason is that minimum wages do indeed have employment effects.If you think of California as one big rich neighborhood, minimum wages act as a zoning plan to keep the "unwashed" out. Setting a minimum wage of $15 is equivalent to saying, "if your skills and education and experience are low enough that your labor is not yet worth $15 an hour or more, stay out." Of course, there are a lot more problems for jobs in California than just minimum wages. At every turn, California works to make operating a business difficult and hiring unskilled workers more expensive. And then there is the cost side. With its building restrictions and environmental rules, most California cities have artificially inflated housing costs, just another way to tell lower income people to keep out. Well-paid new arrivals in California enjoy a life that is far out of reach of much of the state’s population. Besides Hawaii and New York, California has the highest cost of living in America. During the past three years in Sacramento, median rent for a one-bedroom apartment has risen from about $935 a month to $1,230 a month, according to real estate tracking firm Zillow.com. A single mother working 40 hours a week at $15 an hour would spend nearly half of her gross income to afford an apartment at that price. She would pay about 10 percent less for a one-bedroom rental in Houston or Dallas. Sacramento remains relatively affordable compared to other California markets. Median rent for a one-bedroom apartment in Los Angeles is about $2,270 a month. In San Francisco, $3,700. Without subsidies, those prices are unreachable for a single parent making $15 an hour. The key to attacking poverty is creating more jobs, not artificially raising the rates of entry-level jobs. The familiar official [poverty] measure is more than 50 years old, and is showing its age. 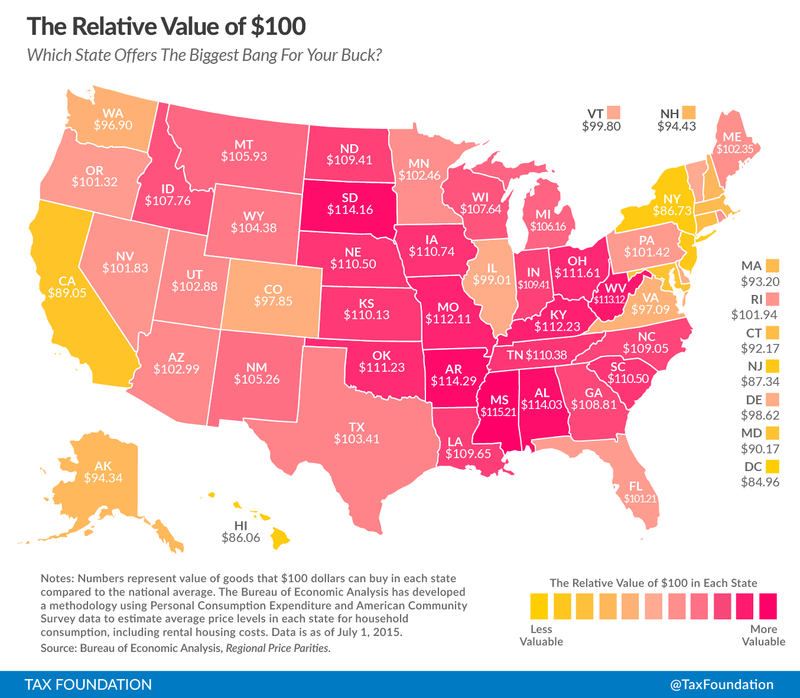 It has two huge shortcomings: it considers the cost of living to be the same in the 48 contiguous states (a patently ridiculous proposition when considering that the average rent in San Francisco in the first quarter of 2015 was $3,458 vs. $867 in Houston), and it doesn’t account for in-kind benefits, such as Section Eight housing subsidies and Electronic Benefit Transfer cards (food stamps). Thus, the federal government’s main poverty gauge undercounts material poverty levels in high-cost states such as California, New York, and Hawaii, while over-counting true poverty in much of the low-cost Midwest and South. The share of minorities in California and Texas is about 50 percent higher than in the nation as a whole, triple that of Wisconsin or Minnesota, more than quadruple that of Iowa, and about six-and-a-half times that of New Hampshire. Thus, it is an illuminating measure the wellbeing of America’s four largest racial or ethnic groups in the two most-populous states that one-fifth of Americans call home. The table below shows the average SPM for four years, 2010 to 2013, for these four groups. I guess its time for a disparate impact suit against California! At first, the link I followed told me this story was from CBS. I found it astonishing that a major news network would challenge a previously agreed on Obama Administration narrative, and sure enough I found that this was not actually from the people at CBS who are paid to write the news (they are too busy reprinting White House talking points) and is actually from one of their financial bloggers. Despite all of the above, unmarried women who've never had a child actually earn more than unmarried men, according to Nemko and data compiled from the Census Bureau. Women business owners make less than half of what male business owners make, which, since they have no boss, means it's independent of discrimination. The reason for the disparity, according to a Rochester Institute of Technology study, is that money is the primary motivator for 76% of men versus only 29% of women. Women place a higher premium on shorter work weeks, proximity to home, fulfillment, autonomy, and safety, according to Nemko. It's hard to argue with Nemko's position which, simply put, is this: When women make the same career choices as men, they earn the same amount as men. "This study leads to the unambiguous conclusion that the differences in the compensation of men and women are the result of a multitude of factors and that the raw wage gap should not be used as the basis to justify corrective action. Indeed, there may be nothing to correct. The differences in raw wages may be almost entirely the result of the individual choices being made by both male and female workers." So this morning I got the Survey of Business Owners and Self-Employed Persons (SBO). Apparently the SBO comes out every five years. It's got a big MANDATORY stamped on it so with a sigh I started it up online to get it over with. The survey was mercifully short, but it was bizarre. After asking me my address, it asked how many owners there were, and then for each owned asked his or her race and gender. And that was it. Suddenly the survey was over, particularly quickly for me because I always refuse to answer race questions on surveys. But that is the sum total of what the government wants to know about business owners - race and gender and nothing else matters I guess. ** I know I always engender outraged comments over this. I refuse to supply the government with data that they will use to pass new laws to make my life harder or take more of my money. As for economists and academics, they are welcome to pay me for the effort of filling this out but I should not be obligated to labor for their benefit. Every year I am required by law to fill out what is called the "Accommodation Report" by the Census Bureau. As a lodging company (we run campgrounds) I must reveal my revenues and some of my expenses. They ask for numbers aggregated differently from how we collect them for GAAP, so it is not a simple exercise. But I do it under protest, even though several of my competitors do not seem to be similarly punished with this requirement. Well, I don't actually fully comply. We run over 150 small locations, and technically I am supposed to fill out an 8-page accommodation survey for every one of them. This would take a week of my time. So I pretend I have only one campground and report my summary revenue numbers for all our campgrounds as if they were for one location. Also, a year ago the Census folks began demanding the data quarterly, and I told them to pound sand, that I was on the verge of not doing the annual report and so I definitely was not going to do all that work quarterly. First, not only do I not have time to figure this out (who tracks software purchases as its own item in the accounting system? ), but it is not the government's business, particularly given that I am a private company. Even the IRS is not this intrusive. Further, at best the data I report will be used for nothing. More likely, it will be used to justify new taxes on me, new regulations on me, or new subsidies for my competitors. I have no desire to aid any of these activities. Postscript: And you know what I have zero patience with? -- otherwise free market academic economists who support this kind of data gathering because it is critical. Yes, I am sure they much prefer to get free statistics for their work gathered via government coercion rather than have to pay for it, as one would have to do if we relied on private companies to gather this data rather than the government. There is absolutely no difference between an economist supporting government statistics gathering and any other company or individual asking that the government subsidize their inputs. But, but, we are critical to the country! Yeah, the sugar industry says the same thing. I am sick and tired of politicians impugning the ethics of private individuals engaged in commerce. There are certainly a small minority of fraudsters in the world of business, but there is a supermajority of unethical people in Congress, arguably approaching 100%. At the Census Bureau, officials got credit for a whopping $6 billion cut, simply for obeying the calendar. They promised not to hold the expensive 2010 census again in 2011. Today, an examination of 12 of the largest cuts shows that, thanks in part to these gimmicks, federal agencies absorbed $23 billion in reductions without losing a single employee. You can impugn business ethics all you want, and I can add a few stories to yours, but I have worked at fairly senior positions in two Fortune 50 companies and as a worker bee in a third, and in all three it would be a firing offense to engage in this kind of Charlatanism. More in my Forbes article from 2 years ago. I frequently write here that almost never does a month go by, even in a state where I have operated for over 10 years, that I don't discover yet another tax I owe or license I must obtain. It is interesting to note that the state does nothing except file my form and bank the fee. This is just another money and power grab -- more cash for the bureaucracy and yet another useless task (filing these forms and sending out compliance letters, etc) to justify their headcount. Then the next time someone suggests "brutal cuts" to state budgets, everyone can scream that the rivers will run brown with sewage because the state won't have the people to collect all the paperwork that duplicates what the County already collects. I am not sure what we have done wrong to be punished with this extra workload, but unless I hear back from you that this report is required of us by law under threat of some sort of dire consequence, we will not be filling it out. We are a small company and only I, the President, am equipped to fill out this form. We already fill out your annual survey and it is incredibly time-consuming for us, for it asks for data in ways we do not normally track it. Further, it asks for our P&L in a form that does not match GAAP accounting, which causes all sorts of difficulties in completing it. And we don’t normally compile results on a quarterly basis, only annual, so this report would be particularly onerous. We actually have to run a business here. Finally, I might add, I am loathe to send the government yet more data since this data will likely just be used as a justification to raise my taxes or increase our regulatory burden. PS- let's just assume the "you have a crappy job" jokes have already been made and move forward from there in the comments. The Department of Labor called this morning, asking me to reconsider my refusal to participate in their monthly survey of employers. One issue I had with the survey, of course, was that it was a time-consuming mess. They called today to ask if I would respond monthly with just my employee counts. I said no. I gave them some variation of my answer that if I were a deer, I would not voluntarily provide my location and movement data to hunters. So I suppose I can expect an audit sometime soon. This is a long-time debate on this site, as I have argued against more intrusive government economic data gathering while the technocratic response has been to argue that if government is going to do certain functions, wouldn't it be better if its data were good. I am happy to see that others feel the same way as me about government data gathering, as apparently there is a push back among Republicans in Congress on the Census Bureau gathering data beyond the Constitutional minimum. I know on my Census response I filled in only my name, address, and number of family members at that residence and left everything else blank. Are We Getting Anything Out of Transit Spending? In the 2012 budget, the DOT will spend about $59.4 billion on highways and $30.2 billion on transit and rail (source). Highways are getting a smaller and smaller portion of what we think of as the Federal highway budget, with transit and rail spending almost 50% the size of highway spending. For what results? Despite huge efforts to get people out of single-occupancy vehicles, nearly 8 million more people drove alone to work in 2010 than in 2000, according to data released by the Census Bureau. Wendell Cox’s review of the data show that the other big gainer was “worked at home,” which grew by nearly 2 million over the decade. Transit gained less than a million, but transit numbers were so small in 2000 that its share grew from 4.6 percent to 4.9 percent of total workers. While drive alone grew from 75.6 percent to 76.5 percent, the big loser was carpooling, which declined by more than 2 million workers. As a result, driving’s share as a whole declined from 87.9 percent to 86.2 percent. Though they get less money in absolute dollars, transit and rail have for years gotten wildly disproportionate amounts of money compared to their ridership. This is not an accident of timing -- rail and mass transit costs per passenger mile are simply way higher than for cars in all but a few very specific high-density urban areas. Much of this Federal spending is a huge waste of money, made worse by the fact that local authorities who get this money have little incentive to use it wisely. Its time for the Feds to get out of the transit funding business. If LA wants more subways, let them pay for it. A while ago, I ranted a bit about a stupid census for our business had to fill out. We get a lot of government data requests that go beyond the numbers required for things like taxes, that are generally being collected by the Census Bureau or the Depart of Labor or some such agency. I throw out unanswered all but the ones that say my response is required by law, but that still leaves quite a few. "Information on these forms will be used by the government to justify taking more tax money from you and/or to justify further restricting your freedoms." Apparently I am required by law to fill out an "annual accommodation report" from the US Census. Just what I needed. The IRS, state sales tax authorities, and the Department of Commerce all gather this same information, but for some reason the Census Bureau needs me to repackage it for them ("estimate time only 34 minutes -- thanks alot"). In fact, they need the data so bad that I am required by law to respond to their request. Here is the weird part. First they ask for revenues including both lodging revenues and sales of merchandise, all as one single number. Then, they ask for "operating expenses" in which they want me to exclude the cost of any merchandise sold. What is the point of gathering a revenue number that includes merchandise sales but a cost number that excludes the cost of goods purchased for resale? Bizarre. My only guess is that this is so they can stack industries up without double counting, but that makes no sense either. If this were the case, they would ask me to eliminate all product purchases (e.g. toilet paper for the bathrooms, cleaning supplies). Also, wouldn't they in that case also ask me to leave out services purchased from other companies? Postscript: The form has this notice: "Your report to the Census Bureau is confidential by law. It may be seen only by persons sworn to uphold the confidentiality of Census Bureau information and may be used only for statistical purposes. The law also provides that copies retained in your files are immune from legal process." ruling Wednesday from a federal appeals court. times more than the cost of moving in the opposite direction. I had seen this Uhaul metric before. The logic is that Uhaul has to keep its fleet of trucks and trailers balanced. If everyone is going one way with them, say from California to Utah, then they are going to end up with an enormous yard full of vehicles in Utah unless they 1) pay to backhaul the trucks to CA empty, which is really expensive, or 2) increase the price of the route to Utah and decrease the price of the route back until they are in balance or until the price of the preferred direction covers the backhaul costs. I had never tried this myself. I always wondered if the examples people use in articles like this are hand-selected or representative. So I tried, at random, LA to Salt Lake City (I have Utah on the brain, I guess, because we are going skiing up there next week, woohoo!) and chose a date far enough in the future I didn't run into any random demand peaks. A one-way 26-foot truck rental from LA to SLC on May 15 was quoted at $1888. The same truck from SLC to LA was quoted at $299! Try it yourself. Frequent readers of my blog know I am a big supporter of open immigration, but it cannot be a good thing to send a quarter of a million of your best educated and most productive people out every year and backfill them with lower-skilled, under-educated immigrants. white men with four-year degrees make more than anyone else. If true, this is really good news. Unfortunately, as I have said in the past, if journalists had been any good at math and science in school, they probably wouldn't have been journalism majors. Never, ever trust stats at first blush in the newspaper. My guess is that the pool of people in these stats is "all women" as opposed to "women currently in the workforce". This would mean that stay-at-home moms would average in as "0", distorting any conclusions one might draw about actual salaries since the prevalence of stay at home moms may vary from race to race. However, this is still good news, especially given the increase in black women going to college.